We have designed these walks to give you a unique way to experience the best of Central Portugal. We have mountain, beach, historical, camino and pilgrimage walks. Each one different and each one special for a new adventure each day. Your guide will share with you their intimate knowledge of each walk along with its flora and fauna. They will be with you all the way to guide you and answer your questions. We are very flexible in our approach. We are happy to discuss with you any changes in length of walks you might wish to make. All tours will be delivered in English. Serra D'Aire - 14 km. 3 to 4 hours approx. Altitude 550m. This walk begins in an area formed during the Middle and Lower Jurassic periods. We will see rocks that form the constituents of the subsoil of the region, a unique geological structure in the country and one of the best preserved of Europe: The Fórnea. The Limestone Massif, whose formation began about 200 million years ago, is essentially made up of carbonated rocks of marine origin. During the Jurassic period, there was an important topographical change as the ocean invaded, covering the soil. 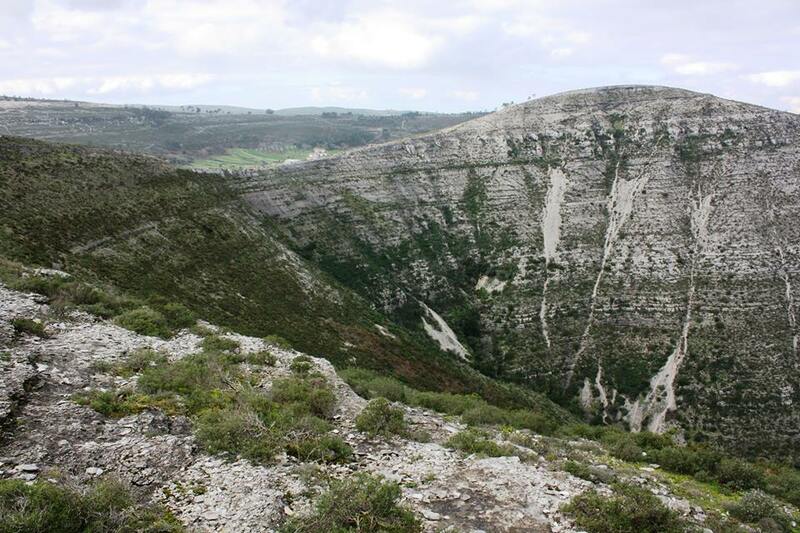 This incursion resulted in the thick deposits that today constitute the Limestone Massif. Camino Santiago - 18 km. 5 hours approx. Altitude 267 meters. 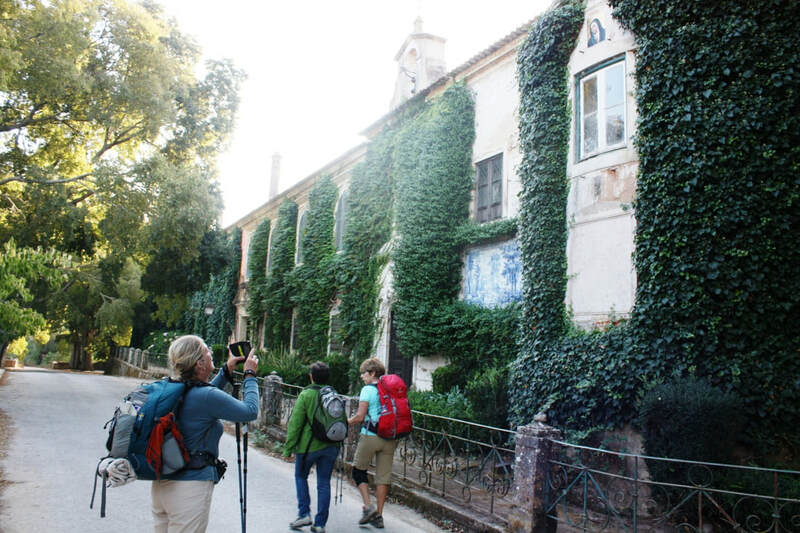 ​This walk is on part of the Camino Santiago – a route that eventually takes the traveler to Northwest Spain to the tomb of St James at Santiago de Compostella. ​The Road of St James (one of the oldest pilgrimage routes in the world), from Lisbon, has been walked over many centuries by hundreds of thousands of pilgrims. The Camino Portuguese is less well known than the routes to Santiago de Compostella through France and Spain. But it is becoming increasingly popular, although still much quieter than the French and Spanish routes. Porto de Mós - 13 km. Altitude 200-400 meters. 3 hours approx. This walk begins predominantly along the tracks of the old railway line that was used for transporting coal from the Bezerra mines to Porto de Mós. There is a wide variety of flora and fauna along the way. Because it is an old railway line, the pathway is composed of thick gravel, which in some parts requires some care in walking. The first half of the route is high, overlooking the valley up to the point it meets the foot of the range of hills that make up the Serra d’ Aire. Suddenly, the scenery changes completely: the rocks cut for the installation of the line become dark corridors in whose walls you can see plants specially adapted to shady places. In cracks in the rocks grow “rupicolous” plants (i.e that grow in stony areas). At the end of the upper line you emerge from the tunnel into the sunlight. The horizon dips towards the sea and at the northern top of the Candeeiros mountain range, wind mills mark the summit. A picnic area invites you to take a break before starting down the lower line. Fatima - 24km. 6 to 7 hours approx. This walk "Nascente (rising) Way" links Tomar to Fátima, the largest pilgrimage center in Portugal. This route, which has two-way markings, helps pilgrims on the Caminho Santiago who also want to visit Fátima to return to the original Caminho Santiago in Tomar. It is called the "Rising Path" because it heads eastwards when the sun is rising. This route crosses mountains (with some physical difficulty) and is very rich in flora and fauna. It goes through towns and villages with a long history and tradition associated with pilgrims. This route is mainly alongside fields and brings you into contact with the real Portugal, where there is still time to stop and reflect. Peniche Beach - 14 km. 3 to 4 hours approx. This walk starts at the Fortress of Peniche, a National Museum of Resistance and Freedom. From there we will walk along the cliff top past the lighthouse to a viewing point. We continue on the coastal path to a footbridge crossing to a promontory with spectacular views of Berlinga Island. Then down to the sandy beach, easy walking, to the surfing and wind surfing resort of Baleal. The resort has a number of places where you can have lunch or a drink or snack. After lunch a chance to visit Consolação Beach with its iodine rich water and rocks. With day long exposure to the sun their therapeutic qualities are used by people who find relief for their aching limbs. ​Not everyone who likes to walk or hike wants to walk all day. Some people prefer shorter walks or hikes at a more leisurely pace. Shamrock Walking Tours have designed shorter guided walks that still take in the wonderful countryside and history of Central Portugal. Ensuring you have great walking and hiking with a little more time to relax and enjoy the delights of our beautiful region. A lovely walk starting in Tomar. It takes you along the Nabao riverbank and into woodlands. In the town of Tomar, this national forest has a landscape heritage and history of its own. A historical walk around the Knights Templar city of Tomar. A wonderful Eco-trail walk in the mountains on an old railway line with a picnic area. A walk on the Portuguese Caminho Santiago from Golega the horse capital of Portugal. Walk the coastline on the stunning west coast of Portugal. Another section of the Portuguese Caminho alongside a railway line and into the countryside. Visit the famous natural amphitheatre in Serras de Aire and Candeeiros Natural Park and afterwards visit the fabulous caves of Mira de Aire. Comfortable hiking boots, trainers are not suitable. Suitable walking clothing and light rain gear. A refillable water container, no glass bottles. Back pack for your belongings. Snack bars for emergency hunger pangs. Hat to protect you from the sun. Choose your dates for guided walking/hiking (see below) and your preference of Accommodation. Email us with the details and we will do our best to get you the most competitive price we can. We aim to have a minimum of 8 people for each walking week but we are flexible on this. Our all inclusive prices start from €499 per person for a one week basic package. This price is based on six nights accommodation for two people sharing a double/twin room including breakfast. A deposit of 20% is payable to secure your booking. This is non-refundable. Please read our Terms & Conditions for our deposit policies. The remaining 80% must be paid in full 56 days before departure. There are no hidden extras in our prices. Transfers will be from Lisbon Airport. You must arrange your own flights and travel insurance. See our Terms & Conditions. Both Ryanair, Aer Lingus and Tap Portugal fly daily from Dublin to Lisbon. Aer Lingus also fly from Cork to Lisbon. Arrival and departure days are midweek as flights are cheaper. ​Clients from countries other than Ireland will need to see which airlines fly to Lisbon from their country of residence. Trips are normally from Wednesday to Tuesday, with walking from Thursday to Monday. Walks are from mid-February to mid-November excluding July and August as temperatures are too high at that time of year. ​We aim to be as flexible as possible. So please feel free to email us with any enquiries regarding length of trip, length of walks, group size, etc. We will do our best to accommodate you on your adventure with us. If you require other dates please contact us and we will endeavour to accommodate you.